One thing all performers can agree on: We’d be nowhere without our teachers. Triple threats have flocked to New York City for over a century to seek work on Broadway and beyond, and great dance teachers have offered inspiration and support since the moment the first tap shoe hit the stage. Though the city has way too many awesome dance instructors to count, here are nine greats who have shaped performers in New York and across the world. This world famous dancer founded the National Dance Institute in the mid-1970s after a successful career with the New York City Ballet. The NDI teaches dance to children of all backgrounds across NYC, and all classes are offered free of charge. In addition to his philanthropic work, d’Amboise has taught at multiple universities and was the first dean of the SUNY Purchase dance conservatory. This beloved jazz and tap instructor had a major impact on the New York theater community during his lifetime. Black began his career as a competitive ballroom dancer and founded the famed Phil Black Dance Studio in 1968. He later taught at the Broadway Dance Center, and had many famous students throughout the years including Ben Vereen, Jennifer Lopez, Goldie Hawn, and the great Chita Rivera. Nicknamed the “Doctor of Jazz,” the late Frank Hatchett was known worldwide as one of the best jazz dance instructors of all time. He taught his energetic, rhythmic style known as VOP jazz to scores of students at NYC’s Broadway Dance Center, and mentored many of Broadway’s greatest dancers before his death in 2013. The co-founder of JoJo’s Dance Factory, Samuels has taught dance all over the world and currently leads three levels of BDC’s Broadway Jazz. She is known for a jazz dance style infused with classic ballet technique, which creates a strong form in her musical theater students. Talent runs in the family; her son Jason Samuels Smith (with fellow teacher JoJo Smith) is an Emmy Award-winning tap dancer known for “So You Think You Can Dance” and many other projects. Nicknamed “Luigi” by fellow dancer Gene Kelly, this famous dance teacher is considered a founding father of modern jazz dance. Luigi developed his innovative movement style after a devastating accident left him partially paralyzed, and his lyrical, expressive dance technique emerged through personal rehabilitation efforts and his determination to dance. The legendary instructor taught at Luigi’s Jazz Centre in New York until he passed in April 2015. This legendary tap teacher and choreographer instructed many of the greats, including Gregory and Maurice Hines, Debbie Allen, and Savion Glover, and earned a reputation as a leader in the tap dance world. He opened his first dance studio in his home neighborhood of Harlem at just 17 years old, and spent the last decade of his life as a teacher in Las Vegas. LeTang died in 2007 at the age of 91. One of the most important names in American-style modern dance, the late Hanya Holmes opened her New York studio in 1931 as an outpost of German dance teacher Mary Wigman’s expressionist style. 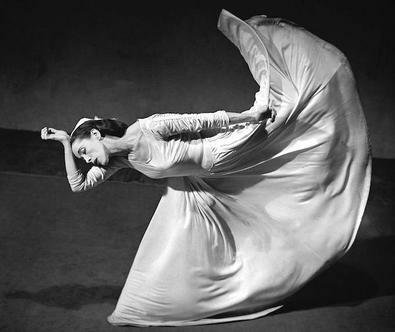 She taught a theatrical movement technique that emphasized form, shape, and an awareness of space, and her work has been carried on through generations of pupils at her own studio and at training programs around the world. This beloved dancer and choreographer made waves when she founded the historic African-American dance company Ballet Negre (later Katherine Dunham Dance Company) way back in 1930. The groundbreaking company performed Dunham’s signature modern dance style all over the world, and Dunham later opened the Katherine Dunham School of Dance in New York City to further her teachings. The school emphasized the intellectual in addition to the physical, and became a charter school for cultural arts in 1947. Famous alumni include Gregory Peck, Sidney Poitier, and Eartha Kitt. Inspired by this post? Check out our dance audition listings!